Location in the Northern Territory of Australia being considered. The project has an area of approximately 1691 ha and is located within waters with current velocities in excess of 2.0 m/s. This would allow for 456 turbines at this location. Clarence Strait is a narrow body of water in the vicinity of the Vernon Islands, approximately 50 km north of Darwin, Northern Territory and south of the Tiwi Islands. It links the Beagle Gulf in the west with the Van Diemen Gulf in the east. The Strait is situated within the Timor Sea with the Vernon Islands located within the Strait. The islands consist of North West Vernon, South West Vernon and East Vernon Island and Knight Reef. These islands form three channels that wind through the area. These are generally 100 m to over 1 km wide and have complex bathymetry. 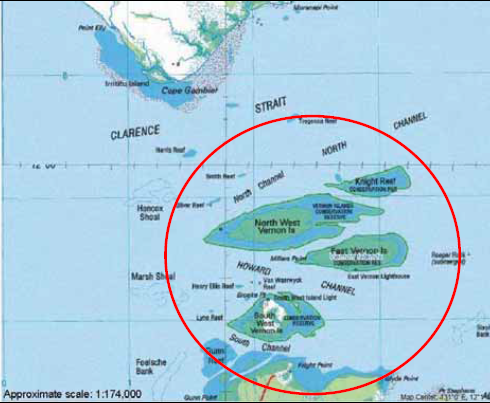 The proposed Clarence Strait site was identified as the site with the greatest tide velocities in the greater Darwin vicinity. Clarence Strait experiences tidal variations of up to 8 m, producing extended periods of suitable tidal currents. The water depth in Clarence Strait varies from 25 to 50 m based on Australia Hydrographic Charts of the area (adequate depth for TEG) and the velocity ranges from 2.00 to 2.75 m/s. Established in 2007, Tenax Energy identified a significant gap in Australia’s renewable energy sector. Recognising that Australia is in a unique position with thousands of kilometres of coastline, Tenax Energy set about researching how to maximise this natural resource to generate green energy and reduce our greenhouse gas emissions. Preliminary details outlining the Clarence Strait project were completed in December of 2008. As of July 8th, 2009, the project is currently subject to review under the Environmental Assessment Act (EA Act). During this period, there will be the opportunity for public to comment at the various stages in the assessment process. These opportunities will be listed on the items for public comment page and will be advertised in the local paper as they arise. No devices are yet in the water. The first stage of the Clarence Strait project involves the establishment of a global centre of excellence in tropical tidal energy. This is supported by MOUs with the Research Institute for the Environment and Livelihoods at Charles Darwin University and with the European Marine Energy Centre in Scotland, and will form an integral part of the initial 10MW or pilot phase of the project. It will accelerate the development of the Clarence Strait project and at the same time contribute to the understanding of the technologies by regulatory bodies in tropical zones and in the Asia Pacific region. A formal Notice of Intent (NOI) for assessment under the Environmental Assessment Act of 1982 was prepared by URS Australia Pty Ltd (URS) on behalf of the proponent Tenax Energy Pty Ltd (Tenax Energy). Although Northern Territory legislation applies to the project area, there is also Commonwealth legislation that will apply to the project as well, notably the EPBC Act. Commonwealth marine areas (section 23 & 24A). Tidal energy generation is a relatively new technology and as there are no previous examples of such a project in the proposed area, consideration will need to be given to site and species-specific monitoring programs for the identification and management of actual and potential environmental impacts. In addition, relevant technical data from environmental impact assessment studies for related technologies should be provided to assist in the assessment of impacts. Clarence Strait Tidal Energy Project is located in Australia. Provide maps and interpret the bathymetry of the turbine project area and along the cable route to identify any seabed features of significance. Describe water quality of marine waters including temporal and spatial variations. Discuss the soil/sediment types and land units within the onshore project footprint including actual and potential acid sulphate soils and existing levels of erosion and other disturbances. Describe floral & faunal species (including exotic/pest species) and biological communities including those of local, regional and national significance1 and listed migratory species that are found within and around the project area (including the wider area of Tiwi Islands, Shoal Bay and Van Dieman Gulf). Describe in detail, species’ important habitats (including for breeding, foraging and migration paths), including maps of regional distribution of suitable habitat, and of habitat within the proposed development area that clearly identifies areas to be disturbed from development infrastructure. Describe the extent and behavior of vertebrate marine species in and around the project in particular sea turtles, dugongs, bird species, fish species (e.g. Narrow-barred Spanish mackerel, Scomberomorus commerson, sharks and rays) and cetaceans (e.g. Indo-Pacific humpback dolphins Sousa chinensis, Australian snubfin Oraella heinsohni). Describe and map native terrestrial and inter-tidal flora and fauna for the proposed onshore cable route and infrastructure. Describe the existing and projected maritime traffic use of the proposed project area. Describe the isolated danger or safety zones required to adequately mark and protect marine turbines and cable routes in the project area. Consult with the Marine Safety Branch to determine device marking requirements. Identification of importance and vulnerability of features identified. Conduct a detailed, physical maritime survey (eg remote sensing and ground truthing). Conduct an archaeological/heritage survey in the onshore area of the project. Describe the impacts on boat based recreation such as fishing and tourism activities including scuba diving, boating and sailing and tourist charter fishing tours. Detail all chemicals, including fuels, to be stored and/or used on the project site. Outline the proposed methods for transportation, storage and use of these substances. Notice of Intent for Clarence Strait. December 17th, 2008. Environmental Impact Statement Guidelines for Clarence Strait. July 2009. Conduct a coastal erosion risk assessment of the shore crossing and any on-shore infrastructure. Discuss measures to minimize identified impacts on species. Describe measures to minimize the impacts on local and international shipping users. Detail measures to mitigate impacts to any features at risk from the project. Detail use of responsible antifoulant compounds, or other antifoulant methods such as smooth surface or regular removal/cleaning of devices.